Of all the forms known to Arabic literature in al-Andalus, only strophic poetry is known to have originated on the peninsula. Despite certain characteristic thematic features, the Andalusian qasida and maqama remained principally products of the Muslim East, but strophic poetry is a quintessentially Andalusian creation and the most complete literary embodiment of the multiethnic and multilingual fabric of Andalusian society. The pride that Andalusians and Maghribis took in these genres is echoed well into the fourteenth century by Ibn Khaldūn, whose survey of Arabic literature culminates in an account of Andalusian strophic poetry. In both its varieties, the muwashshah – the prosodically more complicated form, employing classical language in all but its concluding couplet – and the zajal – which is simpler in form and vernacular throughout – Andalusian strophic poetry is indeed the most distinguished contribution of the Muslim West to the history of Arabic poetry, and its forms are most explicitly involved with the universe of incipient Romance lyrics. The muwashshah is written in Classical Arabic, and its subjects are those of Classical Arabic poetry —love, wine, court figures. It sharply differs in form, however, from classical poetry, in which each verse is divided into two metric halves and a single rhyme recurs at the end of each verse. The muwashshah is usually divided into five strophes, or stanzas, each numbering four, five, or six lines. A master rhyme appears at the beginning of the poem and at the end of the strophes, somewhat like a refrain; it is interrupted by subordinate rhymes. A possible scheme is ABcdcdABefefABghghABijijABklklAB. The last AB, called kharjah, or markaz, is usually written in vernacular Arabic or in the Spanish Mozarabic dialect; it is normally rendered in the voice of a girl and expresses her longing for her absent lover. Such verses make it probable that the muwashshah was influenced by some kind of European Romance oral poetry or song. 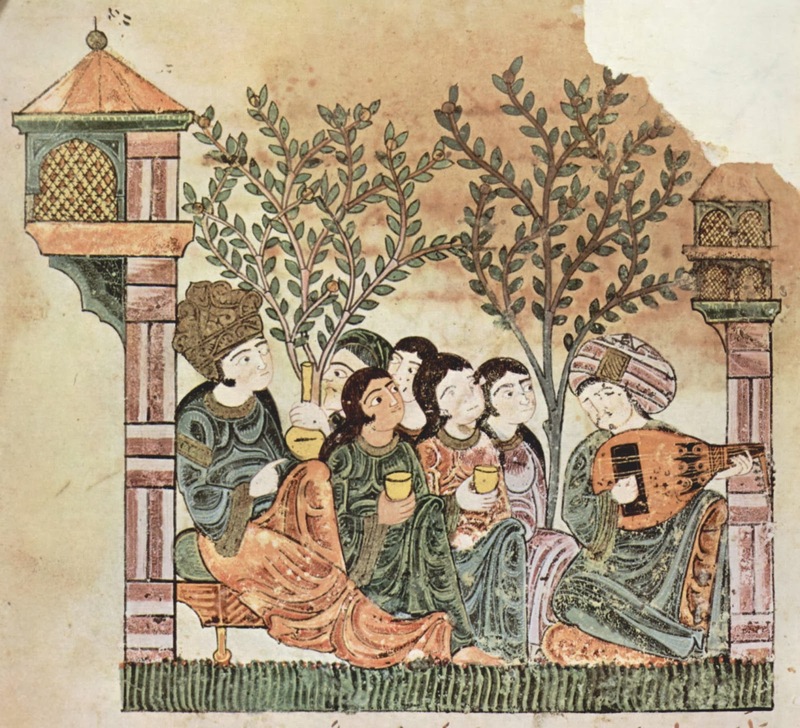 Jewish poets of Spain also wrote muwashshahs in Hebrew, with kharjahs in Arabic and Spanish. This well beloved piece, a muwashah , is in a 10/8 rhythmic mode called sama'i thaqil which originated in Al-Andalus. but the graceful one, the queen of beauty?